Sometimes you just want to keep it simple and sweet when it comes to dressing for the weekend or for dinner/drinks after work. For me, this usually means choosing a few key basics as the foundation of my outfit and then adding a few feminine, dressier pieces to elevate it. Those few extra touches really make all the difference, and if there's one thing I know to be true, it's that I feel my best when I'm on the dressier side of the style spectrum. It's just more "me." I chose pieces in a familiar-favorite color palette: blush, white and grey. Really, though, who doesn't love this color combo? It's soft, pretty, and flattering on everyone. The basic foundation pieces are the white skinny jeans and heather-grey open cardigan; they're both super comfy and look great dressed up or down. I know I've talked about these Ann Taylor white jeans before, but they're worth another honorable mention since they're easily the best non-distressed white jeans I've ever owned. They are stretchy, considerably more opaque than other brands I've tried, and make your legs look long and lean. Yes and yes! I was thrilled to see that Ann Taylor brought them back this season, and that they are still offered in regular, petite, and tall sizes (though the tall sizes appear to be currently sold out online.) The petite length, with the ~26" inseam, is perfect for someone my height (5'2") and hits just at the ankles. I highly recommend them for anyone on the hunt for a well-fitting pair of white jeans. This heather-grey cardigan has quickly become another of my wardrobe workhorses -- I can just throw it on and go. It's a longline open-front style, so it's a really great no-fuss option when you want to add a light layer to your outfit without adding bulk. This one is older from Forever 21, but I found a great match here for only $23! Or, if you prefer one with pockets, I found another great option here. The blush lace peplum top, grey skinny belt, and blush bow block-heeled pumps are the feminine, dressier touches that I love. Peplum tops are always on heavy rotation in my wardrobe and this one from Ann Taylor was an awesome sale score. Unfortunately, it's completely sold out now, but you can easily re-create this look with another blush peplum top like this one (love!) or choose another blush lace top in a different style like this one or this one (so cute!) A peplum top adds such lovely, feminine flair to a basic pair of jeans, and if you don't already own one, I highly recommend you add one to your closet stat! Lately, I've been belting several of my peplum tops, as you've probably noticed. They add the perfect finishing touch in my opinion, plus they add more definition to the narrowest part of your waist, which is always flattering. Belting your tops and cardigans with a slim and sleek belt instantly gives you a more polished look. I opted for a grey one here to keep the overall look cohesive. And last, but not least...these blush bow block-heel pumps. The color. The bows. The style. Perfection! 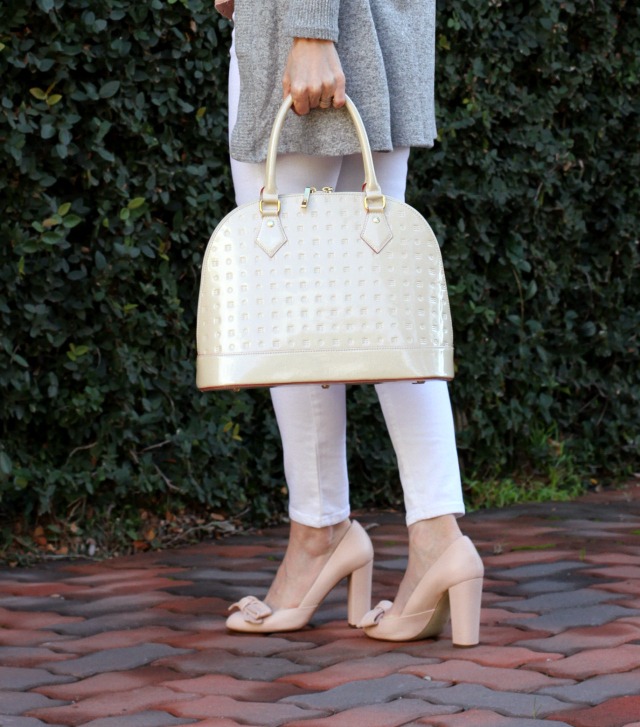 And there you have it: my ideal dressy-casual outfit in soft, pretty tones. This is such a pretty outfit. The perfect mix of chic and casual. I am most in love with those gorgeous block heels! !